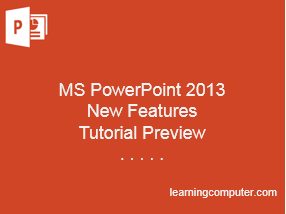 Welcome to Learning Computer MS Office 2013 video training library page. We have developed computer training videos designed to quickly and efficiently embrace the new features of MS Office 2013. Our goal is to provide you and/or your organization video tutorials that are affordable – meeting your budget requirement, and accessable to schedule and review at any time. Our objective is to give users a clear and concise view of the new features, enabling them to quickly grasp the information. Also, find out what features are no longer there! You are deligently working in your excel spreadsheet. You discover you that the data set is larger than you anticipated, hindering you from having a good view to compare information. Locking certain rows and freezing particular panes will keep designated columns and rows visible as you scroll the columns and rows of data in MS Excel 2013. 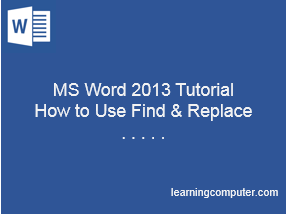 Get some tips on how to do this using the Match Case and Wild Card options in MS Word 2013. You have a set of related data you need to get into a stored table format. There are several on the market, but you remember you can create a database that will fit your immediate needs with MS Access 2013. Here are the links to the Microsoft Office 2013 tutorials. Here are the links to the Microsoft Office 2010 tutorials. Here are the links to the Microsoft Office tutorials.